Clear and frosted surfaces, white-black and yellow-blue, to help the players with a red-gree color blindness. 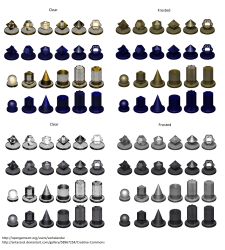 It should be easy to change the hues of the colored versions if you need different hues for your game. Nice, but simplifying licence will be good. If you want credit you should just put one licence. Either CC-BY 3.0 or CC-BY-SA 3.0 will be good. The licenses are options. You don't need to comply to all - just pick one that fits your project and it will be fine. So if your project is GPL, your option is GPL. Otherwise you pick CC-By or CC-By-SA. I don't think removing license options will simplify things. That's not how it works, unfortunately. Right now you have licenses that overlap and are contrary, so it's about as confusing as not giving it a license at all. 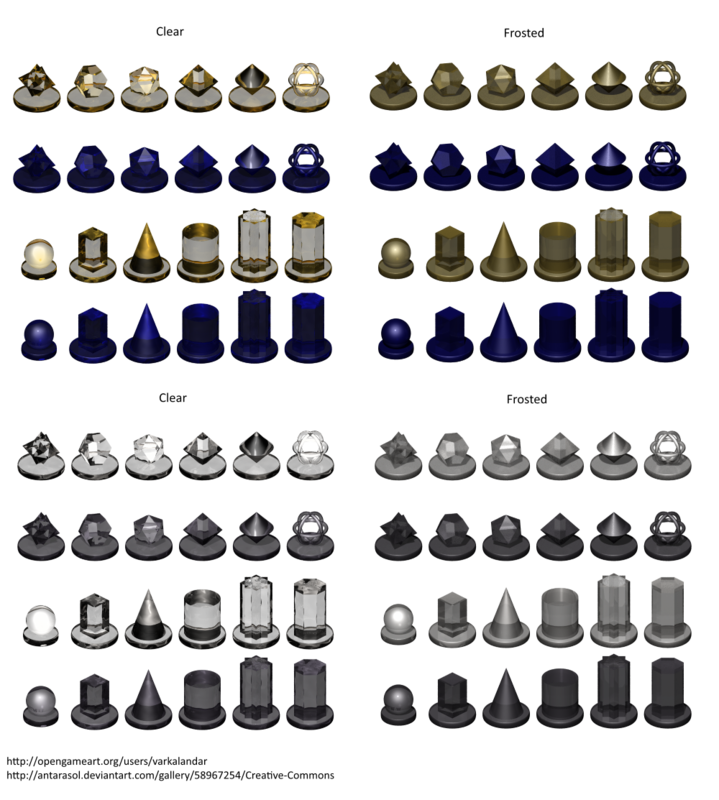 Pick one that you think is the best for the assets, otherwise go with CC0. In other discussions people said, the licenses are options - the user only needs to fulfill one of the offered options, not all. That's why I offer all the licenses which I'll accept my art to be used with. If I'm wrong with the idea that the licenses are "I offer all, you can pick one that suits your project", I'll have to change all my entries here to CC-By I guess ... but before I do that and edit all the entries, I want to be sure (e.g. get word from a mod) that my idea is wrong indeed. Really I won't go after you if you actually use it, regardless of the license, as long as you give credit. I make this stuff to be used in games - I just want a mention in return. And I wonder why this discussion starts now, since I have several dozen of works uploaded with all licenses offered except CC0 which I'll not accept. And also, why the site offers to select many licenses if it's so useless as you say. I'm quite certain that my idea that you need to fulfill only one of them, is correct. SOME ARTISTS HAVE MULTIPLE LICENSES LISTED. DOES THAT MEAN YOU NEED APPLY THE RULES OF ALL LICENSES OR CAN WE PICK THE ONE LICENSE WE PREFER? You must follow only one of the licenses. However, when you re-distribute/edit, you are encouraged to include/use all of the licenses, so the license spectrum (and thus sum of people/projects who can use the art) doesn't shrink. License your submissions with as many licenses as you want. The user may choose ONE that best suits their project. If there is confusion about attribution, it should be clarified in the attribution instructions. Having more than one license to choose from is a fantastic thing! Some have CC By-(SA) projects, other people have GPL projects. Why discourage this? Thanks for the clarification. I've already changed a number of submissions to CC-By only, will change them back to allow GPL and OGA-By as well. Good point about cc0, but I've seen programmers choose GPL even when CC0 was one of the options... just for the sake of simplicity. "All assets are GPL" is a lot cleaner than "All asssets are GPL except goat_head.png, running_fat_guy.gif, and happy_intro_tune.ogg; Those ones are CC0."